The sarcomere is the fundamental force-generating unit of muscle. It follows a predictable length-tension relationship, and this is fairly well-understood by many who study muscle, train individuals, and rehabilitate patients. If I were to ask a personal trainer, physical therapist, or exercise science student, I am sure (hopeful?) that they could tell me that this relationship consists of an ascending limb at short lengths, a plateau in the middle, and a descending limb at long lengths. However, things may start to become unclear when asking people what the plateau in the middle – where sarcomeres produce the most force – is called. The purpose of this post is hash out some confusion regarding nomenclature and the point at which sarcomeres can produce the most force. To ensure that we are on the same page, it seems prudent to describe terms and definitions that are commonly used, how they are described in the literature, and how I will be using them in this piece. The following are taken from Fridén & Lieber1. Personally, I do not find the definition of resting length provided to be very informative, so I will expand on it. It is common to see the length-tension relationship illustrated with an active and passive component. Here, the point on the x-axis where the passive component begins to contribute tension is defined as the resting length. This is well-illustrated in Figure 1, below. For the remainder of this article, I will refer to this definition as restingproper. This definition differs greatly from a more lay definition or understanding, in that one may think resting length is the length of a muscle when the joint(s) it crosses is in the "neutral" position. (How one chooses to define neutral is a different discussion altogether.) I will refer to this definition as restinglay. Figure 1. Muscles with different passive length-tension relationships, and thus restingproper lengths, are depicted. Curves #1, #2, and #3 would have restingproper lengths of 1.5, 2.5, and 3.5 µm, respectively. Figure from Fridén and Lieber1. In multiple classes, I was taught that muscles, and thus their sarcomeres, produce the most amount of force while at resting length. (Note that no subscript is associated with this definition, because it is presented with ambiguity; therefore, I will cover this topic as it applies to both restingproper and restinglay.) This idea appears to be fairly rife, as it is suggested by a number of textbooks2-4 and authoritative organizations5-7. Unfortunately, it is incorrect. From the definitions presented above, one can clearly see that optimal length is the appropriate term to describe the length at which sarcomeres produce the most force, especially when compared to restingproper, as the passive length-tension curve may shift horizontally in a muscle-specific manner (Figure 1). In other words, it is possible for the passive length-tension curve to begin at lengths that are different than optimal length. While this does not preclude restinglay from also representing optimal length, other work does. The operating range and restinglay length of sarcomeres within a muscle appear to be heterogeneous and muscle-dependent. Both in vivo8 and cadaver9–10 work suggest this. 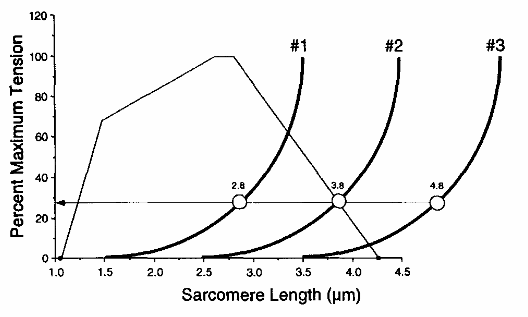 See, for example, Figure 2, which shows that different muscles not only have different restinglay sarcomere lengths, but also different operating ranges. The heterogeneity of restinglay lengths is further evidenced by a cadaver study by Ward and colleagues9, who reported sarcomere lengths of every major lower extremity muscle (Table 1). Figure 2. A) In vivo length-tension relationship of wrist flexors and extensors. The wrist flexors tend to reside on the ascending limb, while the extensors reside closer to optimal length and cross into both the ascending and descending limbs. FCU = flexor carpi ulnaris; FCR = flexor carpi radialis; ECRB = extensor carpi radialis brevis; ECRL = extensor carpi radialis longus; and ECU = extensor carpi ulnaris. B) The length-tension relationship of the lumbar multifidus muscle. Together, these data provide strong evidence that optimal length does not occur at restinglay length. From Lieber and Ward8. Table 1. Sarcomere lengths in the lower extremity muscles of cadavers. Although the length-tension relationship itself is fairly well-known, how it relates to muscle in vivo is less discussed. Here, I presented evidence from the literature that shows that the length at which sarcomeres can generate the most amount of force – optimal length – does not necessarily occur at restingproper or restinglay length. This has important implications for understanding movement and strength curves, in that the length-tension relationship of an entire muscle cannot be known without knowing how the sarcomeres in a muscle are organized. As demonstrated, this is muscle specific. We are only in the beginning stages of measuring sarcomere lengths in vivo, so I am hopeful that we will know a lot more about these relationships within the next decade or two. I would like to thank Geoff Futch for his thoughts regarding the different possible definitions of resting length. The header of this article is from Lieber & Ward8. Friden J, Lieber RL. Evidence for muscle attachment at relatively long lengths in tendon transfer surgery. J. Hand Surg. Am. 1998;23(1):105-110. McGinnis P. Biomechanics of sport and exercise. Human Kinetics; 2013. Bartlett R. Introduction to sports biomechanics : analysing human movement patterns. Milton Park, Abingdon, Oxon: Routledge; 2014. Powers SK, Howley ET. Exercise physiology : theory and application to fitness and performance. 7th ed. New York, NY: McGraw-Hill Higher Education; 2009. Haff GG, Triplett NT. Essentials of Strength Training and Conditioning 4th Edition. Human kinetics; 2015. Clark M, Lucett S. NASM essentials of corrective exercise training. Lippincott Williams & Wilkins; 2010. Clark MA, Lucett S, Corn RJ. NASM essentials of personal fitness training. Lippincott Williams & Wilkins; 2008. Lieber RL, Ward SR. Skeletal muscle design to meet functional demands. Philos. Trans. R. Soc. Lond. B Biol. Sci. 2011;366(1570):1466-1476. Ward SR, Eng CM, Smallwood LH, Lieber RL. Are current measurements of lower extremity muscle architecture accurate? Clin. Orthop. Relat. Res. 2009;467(4):1074-1082. Herzog W, Abrahamse SK, ter Keurs HE. Theoretical determination of force-length relations of intact human skeletal muscles using the cross-bridge model. Pflugers Arch. 1990;416(1-2):113-119.